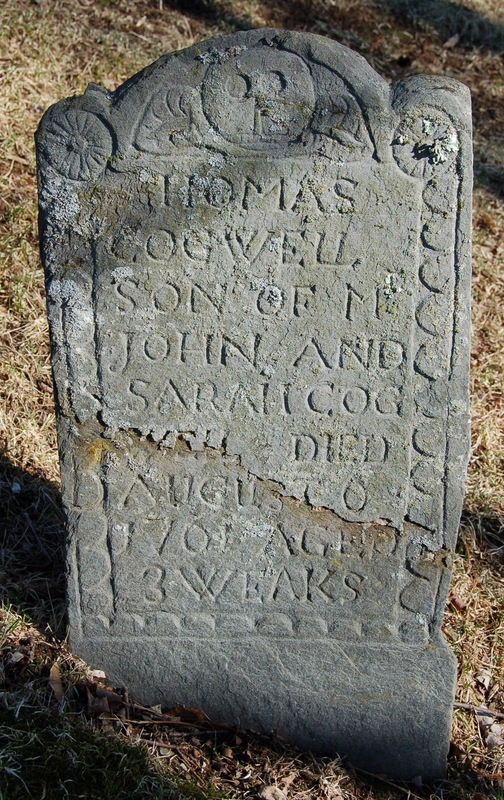 This little Thomas Cogwell, like everyone of the name in these parts, was a descendant of the Massachusetts immigrants Thomas Cogswell (abt1592-1669) and Elizabeth Thompson (abt1598-1676), both of them passengers on the Angel Gabriel in 1635. The Angel Gabriel was one of the few Great Migration ships that was wrecked -- in its case, by the Great Colonial Hurricane of 1635. The ship was driven onto the rocks at Pemaquid, Maine, 15 August 1635; the passengers came close to drowning, but nearly all made it to shore with their lives, even though all their possessions were lost. 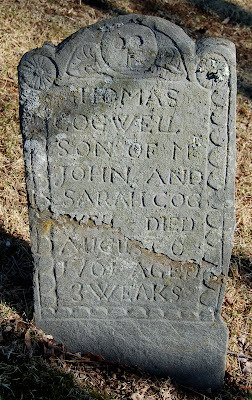 Had John and Elizabeth drowned in that shipwreck, little Thomas Cogwell would never have been born. But then neither would John Adams, Ralph Waldo Emerson, Calvin Coolidge, Nathaniel Hawthorne, Julia Ward Howe, Oliver Wendell Holmes, and Princes William and Harry of England, all of them descendants of John and Elizabeth Cogswell, washed ashore on the Maine coast in 1635.